Databases contain online versions of newspapers, magazines, journals, encyclopedias, dictionaries, and book chapters. Since you access databases online, many people think they are websites. They are NOT websites.You must login to gain access to databases because they are proprietary resources leased for use. Some of the databases listed below on the left side under IRSC Students & Staff are available to students and staff remotely (anywhere with Internet access) by logging in with a student ID and PIN. The databases from the Florida Electron Library listed on the right side of the screen below are available to any Florida resident. 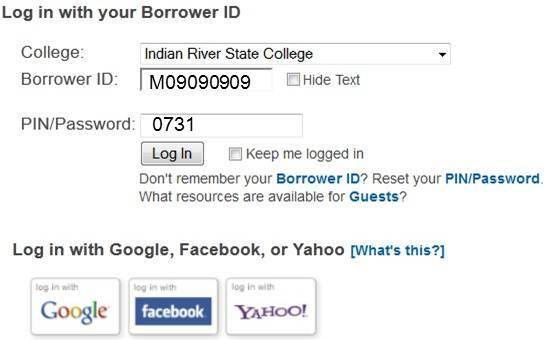 You may need to input your county library card number to gain access the first time you visit the website. When searching databases, you can be more specific with your keywords for a more precise list of results. You can search within the title, abstract, or full text of the item. The hardest part of searching databases is knowing which one to choose. The IRSC list of databases offers brief information about each resource. You can also search for databases by subject to help you more easily select appropriate databases. Try these online databases to find health related peer-reviewed articles about your topic. Remember to choose FULL TEXT. Click the Health and Medicine subject to display the databases listed below. CINAHL is Cumulative Index to Nursing and Allied Health Literature and offers a wide variety of limiters underneath the search box. Use the "Advanced Search" option and limit your search to documents with full text. If you get too many results, try adding more keywords. Find videos, podcasts, newspaper articles, academic journal articles, and magazine articles. Full text for nearly 1,200 journals with coverage dating back to 1965. Authoritative medical information on medicine, nursing, dentistry, veterinary medicine, health care system, and much more. Use the Multi-Field search and expand the limits to see more options for searching. Since 2003, the FEL has provided over 190 million articles, e-books, videos and other electronic resources to the citizens of Florida. Depending on your location, you may need to enter your public library card number the first time you visit the website in order to access all of the information. Library cards are free at your local county library. The website is funded under the provisions of the Library Services and Technology Act from the Institute of Museum and Library Services. Made available through the Florida Electronic Library.